Home » Software » 3 Tools to Recover Deleted Email Messages from a Corrupted Database in The Bat! There are many email client software applications such as Microsoft Outlook, Mozilla Thunderbird, IncrediMail, and one of our favorites is The Bat!. The Bat! is a solid and secure email client software that has been in active development for nearly 20 years. It allows you to protect your data by encrypting the message base and address books on-the-fly with no noticeable speed degradation. There is no surprise that The Bat! is found to be commonly used by advanced users who put security first. Just like any other email client software, it is prone to losing the email messages either by accidental deletion from the user, or by database corruption due to power loss, system crashes or even by malware that is programmed to do that. When you delete an email from any folder such as Inbox, Outbox or even Sent Mail, the emails will be moved to the Trash folder, just like in the Windows operating system where a deleted file will go to Recycle Bin giving you a chance to restore the deleted file. However if you’ve emptied the “Trash” folder or used the alternative deletion method such as pressing Shift+Delete, the email will be deleted from the folder without moving it to Trash. It may seem like a permanent deletion, but in fact the email is simply marked as deleted and still exist in the database. If this is the case, you can view the deleted messages by clicking the Folder from the menubar and selecting “Browse Deleted Messages“. The deleted messages will show up with a strikethrough and you can now restore it back by pressing the Delete key to undelete. This will only work if you haven’t compacted the folder. By compacting a folder, The Bat! will permanently remove the deleted messages to reduce the size of the email database (messages.tbb). This function can be found in the “Maintenance Center” from the Folder menu bar, or one can also manually compact a folder by pressing the Ctrl+C shortcut key to compact a specific folder. Since version 6.2.14, an improvement has been made on The Bat! where it will only auto compact on exit when more than half of the message base size is occupied by deleted messages. If you have a corrupted message base, here are a few tools that can help you to recover some missing email messages. Please create a backup of the original database files before using any of the tools below in attempt to recover deleted/missing email messages. The Bat! 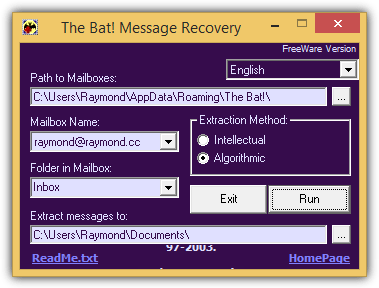 Message Recovery is a free and small tool that is able to extract email messages from The Bat!’s database using two different methods which are the “Intellectual” or “Algorithmic”. Although it is not meant to repair the corrupted TBB database, you can use it as a workaround to extract all the email messages and then reimport all the missing emails back to The Bat! from Tools > Import Messages > From .MSG/.EML-files. Using this tool is very straight forward. First you’ll need to select the path to mailboxes, choose the mailbox name and mailbox folder, and set the path of the extracted messages. Finally click the Run button and all the messages will be extracted with the .msg extension. By default, the Mail Directory path is located at %APPDATA%\The Bat!\. There is a bug on this tool where it does not recognize the %APPDATA% environment variable. What you can do is copy this path %APPDATA%\The Bat!\ and paste it to the location bar in Windows Explorer. The location will be transformed into an absolute path which is something like C:\Users\Raymond\AppData\Roaming\The Bat!. Copy the whole path and paste it to the “Path to Mailboxes”. Obviously this might not be a very good solution if your mailbox contains thousands of email messages. You can try other solutions listed below. tbb2mbx is an old command line based tool that can convert a corrupted The Bat! message base (.tbb) file to a unix mailbox (.mbx), hence the program name tbb2mbx. The trick here is to convert the corrupted messages.tbb file to a .mbx format, and then re-import back the messages to The Bat! from Tools > Import Messages > From UNIX-mailboxes. It is best to import the converted UNIX mailbox to a new folder in The Bat! or else you might end up with duplicate email messages. Not a big problem if you end up with duplicate email messages because The Bat! has a function to automatically remove duplicates from the Folder menubar and select “Delete Duplicates“. If all else fails, you may want to rely on paid software to do the job. 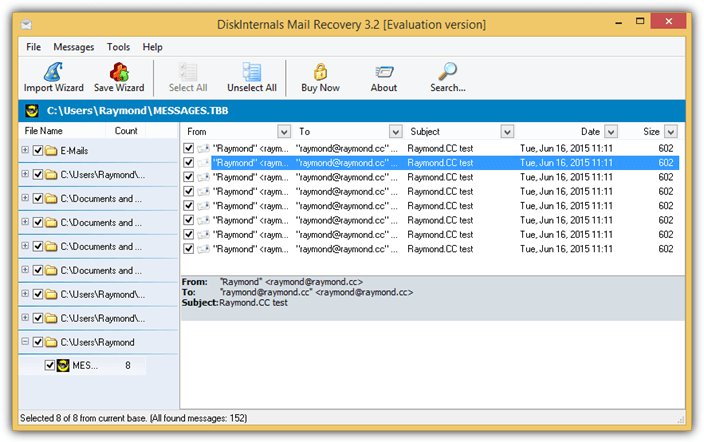 DiskInternals Mail Recovery is an advanced shareware tool that is able to recover email and the address book after a disk crash, and repair the email database. It cost a whopping $99.95 for a single personal license while the free trial allows you to preview all the emails inside the program, the saving feature has been disabled. This is useful enough to determine if the program is able to recover any important emails which you’ve lost. There are 3 options to select in Import Wizard. 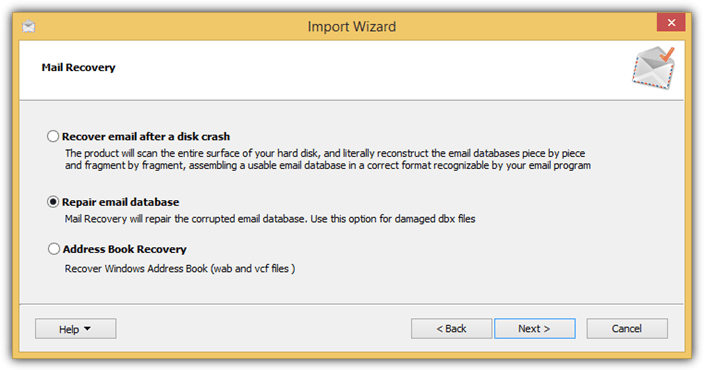 The first option “Recover email after a disk crash” is a very thorough scan on the hard drive in attempt to reconstruct a usable email database which can take a very long time to complete if you have a large hard drive. The second option is useful if you know where the email database is located while the third option is only to recover the Windows Address Book file and Vcard. We’ve also found a similar software called SoftAmbulance Email Recovery which has the exact same user interface and features, so we believe it is actually the same product but has just been rebranded. Huge thanks to you. Your instructions were crystal clear and your help saved me many hours of frustration. Sincere thanks! It is nice resolution for those who lost their messages. I have used TheBat for years and its a great program with only a few idiosyncrasies! I always just went into the ‘trash’ folder and re get the emails from there if I deleted any I didn’t mean to delete. Maybe I have it set up differently or something. Or ids it perhaps that when you delete with the key commands, you bypass the trash folder? I am DL’ing the utility anyway as I want to be prepared…you never know! Good useful article AND, well done for giving the best email program out there some coverage! I remember trying out The Bat! (and Pocomail !) way back. Since then I moved on to Outlook, and ever since Gmail I don’t use any desktop clients. Same for almost everyone I know. If I need to keep local copies of my email, I use gmail’s offline mode. Or Thunderbird. I’m sure there are reasons one would use TheBat, like if they have a lot of time/email invested in it, but other than that I can’t think of any. Raymond thanks for this thread. Yap useful the Bat it is, and how many time I deleted important email, well I lost the count.